This attic windows quilt block pattern was originally used for a quilt block exchange among friends. 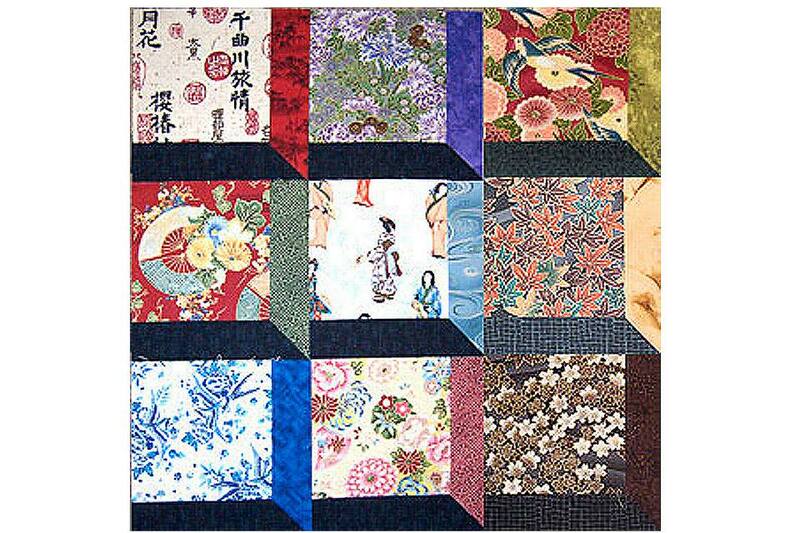 The quilters used oriental themed fabric but the quilt block works perfectly for any other color scheme or theme you'd like to design. Only three seams are required to sew each attic windows quilt block, and the larger motifs found in oriental and many other types of fabrics give you an opportunity to practice fussy cutting. 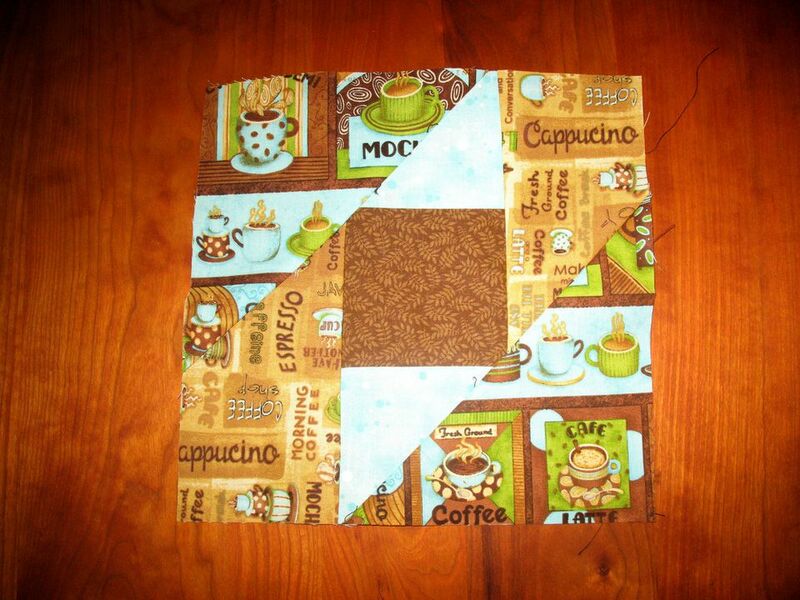 One corner of each block is connected with a mitered seam but don't let that discourage you from trying this easy quilt block. Sew with an accurate quarter inch seam allowance. Place your 6-1/2" x 6-1/2" large-scale print square face up on a table. Place the coordinating tone on tone bar to the right of the square. Place the black bar at the bottom of the square. Do you like the color arrangement? If not, try a different tone on tone fabric to find a print that works perfectly. Position the coordinating tone on tone fabric with the right edge of the square, right sides together and top edges of both pieces aligned. Use a pencil or straight pin to make a mark 1/4" inward from the side and bottom edge of the large print (pin is illustrated upper right). Sew the pieces together from top to bottom, stopping at the mark. Take a couple of backstitches to secure the seam and remove the partial block from the sewing machine. Fold the tone on tone strip of fabric out of the way as illustrated (bottom left) and align the black strip along the bottom edge of the square, right sides of the fabric together and left edges aligned. Fold the right edge of the black strip out of the way and find the spot where you stopped sewing the first fabric to the square (bottom left illustration, black strip folded back to find the original mark). Re-align the black strip if necessary and put a pin through the original mark (end of seam), 1/4" from the edge of the square (upper right). Turn the unit over and sew the black strip to the square, stopping at the pin and taking a few backstitches. Press the seam allowances towards the narrow strips. Fold the block right sides together on the diagonal. The black strip and the tone on tone strip of fabric should match. Place a ruler along the folded diagonal edge as illustrated, upper right. Following the ruler, draw a diagonal line on the visible portion of the bottom strip. Sew a seam along the line, starting where the previous seams ended. Take a few stitches and backstitch, but do not sew beyond the original starting point. Sew all the way to the end of the strips. Trim the strips along the diagonal as shown. Open your attic windows quilt block and press.